This past weekend, I was invited by The Stronach Group (aka the owner’s of the Pimlico Race Track) to attend the Preakness Stakes event. In case you’re not aware of what Preakness is - it’s the second of the three big horse races. The first one being Kentucky Derby, second being Preakness Stakes and the third being Belmont Stakes. I’d been to the Virginia Gold Cup, which was still thrilling to me. BUT THIS - this was on a completely different level. We’d be wined and dined in the owner’s chalet…something I didn’t find a lot about on Google, thus, how this post came to life. Essentially I had no idea what to expect. Mostly, I was concerned about what to wear. I reached out to one of my favorite bright, race-worthy brands, Draper James, and asked for a little help in the outfit department. 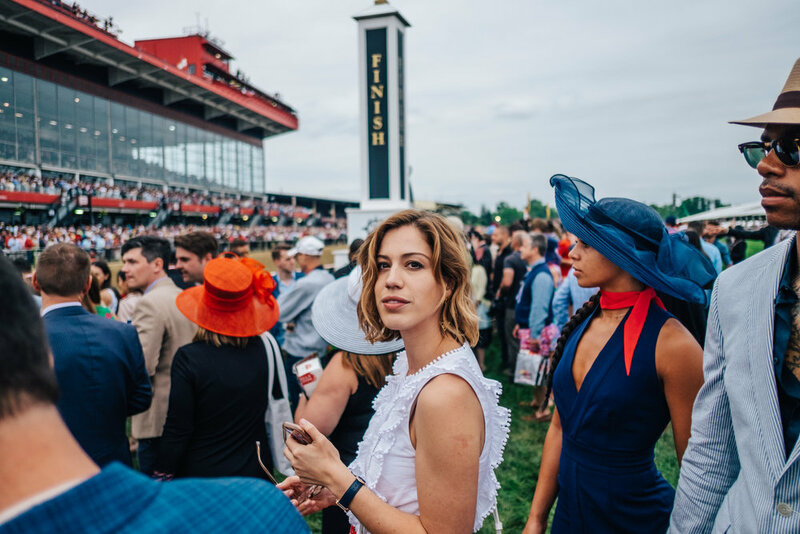 And after reading this article about Belinda Stronach’s goals to help incorporate youthfulness and a fresh perspective into Preakness, I asked if they'd would be interested in having me share an inside look into the owner’s chalet with their audience. And so the Snapchat takeover began. On the day of the race, I decked myself in Draper James, threw on a borrowed Gucci belt, tried on a thousand pair of heeled sandals, and grabbed this Clare V bag before rushing out the door. The race was in Baltimore, but luckily, we had pre-arranged parking passes coordinated by the PR company, BrandLinkDC. One less thing to worry about - phew. When we got to the event itself, my clueless self waved our parking pass our the window at the security guard as we waited in a long line of cars. He showed us into the VIP parking lot next to the venue and we had the car valet’ed upon entering. Now - how to get in? 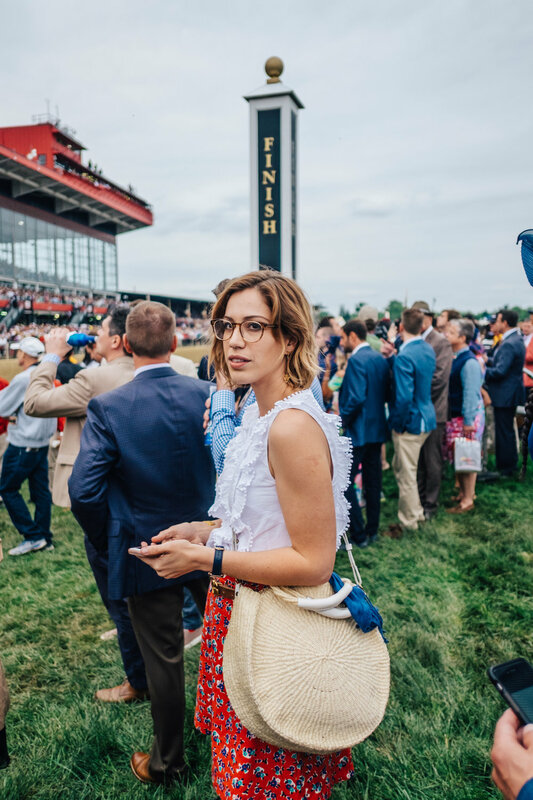 Again, I walked over to someone who looked official, showing her my fancy Stronach Group lanyard and the nicest lady of all time ushered us into a secret entrance where we waited until the track cleared so we could cross over into what seemed like VIP Land. The sidewalk leading up to the tents were lined with potted plants and a white picket fence (#AESTHETICGOALS) I stopped on the walkway - a sign to my Insta Hubby that it was time for pics. After 5 minutes of laughing, walking and posing (it only looks candid, my friends) I sent a few pics over to the social media manager at Draper James so we could share something in the moment on Instagram to promote the Snapchat Takeover. Walking into the tends, it was very clear that this was going to be a very good day. Multiple bars were placed strategically around the tent - and by tent - I mean imagine a tent that a queen would use if she went on a safari…decked out in Ralph Lauren-style decor and couches for us heel-wearers. Hors d’ourves were comprised of very top-of-the-line treats like beef strips and shrimp cocktail for the meat eaters, and quinoa-kale salads, roasted beets with goat cheese, sweet potato fries and mushroom tart for non-meat eaters like me. The hubby and I both started with the drink we couldn’t live without - coffee. They served it in the prettiest cups I’ve ever seen, so I made my way outside to snap a few photos of how pretty it was. Out of the corner of my eye, I spotted my favorite TV villian/heros, Kevin Spacey AKA Frank Underwood. He was laughing with someone in the VIP VIP area (yes, I typed that twice) closed off to us regular folk. I had heard rumors that he’d be in attendance, but to see him in the FLESH - it was something else. I tried to catch my breath, without much luck. Where was Robin Wright? Had they come to save us all? I could only hope. This celebrity sighting had to be celebrated. So I dragged my hubs to the nearest bar where I ordered the official drink of the event, a Black Eyed Susan (which was very delicious, I might add.) However, a bit too sweet for the hubby, who went with whiskey on the rocks. Just then, I got a text from my friend in Australia, with a photo of a Victoria Secret model. “YOU MUST GO FIND HER!” the text read. I rolled my eyes. There was no way I was about to stand next to a Victoria Secret model in any capacity. It’s social suicide. But when I saw Josephine Skriver posing for cameras out of the corner of my eye, I thought, heck, you only live once, right? So I meandered over to her, introduced myself, and asked if I might snap a quick photo with her. She was LITERALLY the kindest and said, “of course!” Which was definitely an improvement from my earlier attempt to snap a photo with my football coach hero Bill Belicheck who replied quite frankly, “I’ve had enough photos today, I’m gonna pass.” (To which I wish I would have replied, “passing is for Brady…” but thought of it 10 hours too late. Seeing the horses up close was something else. They were honestly going so fast that I could barely keep up with them on my phone. And this, you see, was one of the smaller races - the big one was still yet to come. After all that snap chatting and slow-motion-videoing, I noticed my battery sliding into the red zone (under 20%) so we made our way over to the charging stations. We stood next to a couple tall gentlemen, and started to chat with them. We exchanged pleasantries, talked about Kevin Spacey (because how can you not?) and then I asked them what they did for a living. “Well, we play football,” they said. “Oh cool, where?” I naively asked. “For the Ravens,” they replied. I almost spit out my Black Eyed Susan. Here we were, causally chatting with football players from the Baltimore Ravens. We talked for about 20 more minutes while our phones charged when some swooning girls came over and started talking with them. Understandable. But before he left, he made sure to tell my husband what a lucky guy he was. And then I died. Come to find out that player was Alex Lewis. I made sure to tell him that when the Patriots weren’t playing, I’d be cheering on the Ravens from now on. When the BIG RACE was about to start, the hubby and I ran as quickly as we could to the track. The professional photographers were obviously a bit annoyed at all of us cell-phone-camera amateurs blocking their view, but that didn’t stop me. We were standing right at the Finish line, so I wasn’t about to miss a once-in-a-lifetime opportunity to capture a historic moment. The race began, and horses zoomed past the mosh-style group of well-dressed watchers. Guys were screaming at the screen behind us, telling their chosen horse to “C’MON” and “GET UP THERE.” We’d bet on three horses, so I was feeling pretty good about our odds. Which three, I had no idea. As they came into view, the camera phones came up and everything seemed to turn into slow motion. The jockeys sitting low on the horses, the men in front of me pumping their fists…I tried to capture the two horses neck-and-neck but they literally passed by so quickly that I almost missed them altogether. Immediately after, lots of people were asking, wait, so which one won?! After review on multiple phones, it looked like Cloud Computing had stolen the show! I turned to my hubby with a, “Did we bet on him?” look and he smiled.